MailNotifier is no longer maintained on WoWInterface. For the latest release, check Curse. Several localization improvements, including new languages (only Russian missing). A special thank you to everyone who helped to translate this addon. There's a bug that, in some situations, prevents MailNotifier to detect new mails at startup. We're currently working on the fix. Have you updated to the last version? If not, is the same as nothing. Last edited by binkenstein : 03-19-11 at 03:49 PM. Putting into the char savedvariable folder made no difference. Generic SavedVariable file shows "Jaliborc_WentCurse = true" after a blank line, so I assume that must be correct. I'll see if the blank line did anything, and then paste it into the char specific files. I can reproduce it. Logged in on two different characters, got the message both times. Logged out & back in on the second, still comes up. What's the flag in the savedvariable file to turn it off? That's a bug pal, you can report the bug or rage about it like you done before, but only one gets it fixed. EDIT: Cannot reproduce. It shows up the first time and never appears again. this window appears every time, i log in with any char, not only on first use. so you can call it "telling one what to do". Last edited by jaliborc : 03-17-11 at 01:24 PM. Ok, good for you. Bye! P.S: By the way, no one is telling you what to do, we are simply warning you in advance. Also, it's "I don't start downloading" and not "I doesn't start uploading". I doesn't start uploading anything from curse.com. Nobody tells me, where i have to download my addons, so bye bye MailNotifier. Last edited by jaliborc : 03-16-11 at 09:26 AM. Fixed, should release new version in a few days. 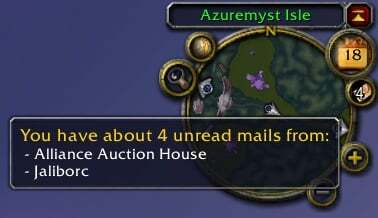 When I receive multiple game mail messages at the exact same time, Mail Notifier plays the "you've got mail" sound for each mail simultaneously. When there are more than three mail at the same time it's REALLY, REALLY LOUD. I'm going to end up with tinnitus if this keeps up. "MailNotifier has been blocked from an action only available to the Blizzard UI"
Last edited by Twidget : 12-08-09 at 02:52 PM.